In a theater there sat a critic. No, not a nasty, bitter fart of a critic, but one that loves new ways of doing things. 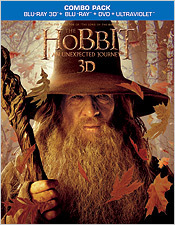 That critic watched The Hobbit: An Unexpected Journey in IMAX 3D, and while he loved the film itself (when he wasn’t being tortured by the over-bright, freakishly fast and smooth moving 48 fps picture before him), he was fairly underwhelmed by his experience in the third dimension. As he journeyed on, he discovered upon subsequent viewings that the movie had almost certainly not been optimized for the large format IMAX screen… and that 48 fps most definitely was still bloody terrible no matter how you slice it. The Hobbit has now come home on Blu-ray 3D, spread over two discs for maximum bitrate comfort and in somewhat better shape than last we left it, even if it’s only the blessings of the smaller screen covering up warts. Still, in the now four different formats I’ve seen it (IMAX 48 fps 3D, RealD and RealD 48 fps, and Blu-ray 3D), The Hobbit is still, at best, a schizophrenic stereoscopic experience. The more practical a scene is – say Bag End – the better the 3D experience is in general. It’s when we get into the heavily CG-manufactured sequences that we start to run into problems. You have to remember, the human brain processes 3D’s depth illusion by relying on the brain’s expectations from prior experience. The more “familiar” a scene appears, the faster you acclimate to a particular shot – a fact that Dredd used to great effect. But when the illusion being presented is counter to the brain’s experience, that’s when the entire experience starts to go awry. NASA scientists were actually quite aware of this phenomenon when training astronauts to go to the Moon – without an atmosphere, objects far away on the horizon can look light they’re right next to you. The astronauts were constantly warned to not trust their own estimations for safety purposes. The crystal clarity of everything in The Hobbit is its 3D downfall. I’m looking at an immense underground cavern, where everything is perfectly in focus – there’s no distance haze. With no familiar depth cues for my brain to latch onto, instead it concentrates on the greenscreen compositing and the digital animation and it all looks less realistic – as when the Elves approach the throne in the Dwarf hall in the film’s opening. Without direct inside knowledge of the production (but after consulting with CG animators, compositors and 3D specialists who work on your favorite summer blockbusters), I think I’ve narrowed down the biggest problem here to one sentence: Time was not on their side. 48 fps means double the frames to render and 4K resolution (as the film was shot) means four times the video data of a normal 2K production. The Hobbit contains on its production master then eight times the normal post production data crunching of your average theatrical film. Combine that with the need to develop or re-develop tools for 48 fps, not to mention the time needed to learn how best to work with 4K and 48 fps, and the production team simply ran out of time here. They delivered the best 3D experience they could in the time available. But there just wasn’t time to fully tweak the shots, to spend the time layering in depth, or finding the ways to blur the extra frames together enough that they looked like film and not the latest special on the BBC. I’m sure that there’s a lot of people at WETA and Wingnut Films that wanted another year to work on this film, or even another six months to make it look its best, but they just didn’t have it. So is The Hobbit in 3D worth your time and money? Yes. Is it the best 3D experience of the year? Not even close. This is a faithful representation of what was presented in theaters, warts and all. The high bitrate used ensures that the image holds the same ultra-clarity of its source without any compromise. And when the 3D is good, landscapes, forests and Bag End all exhibit superior depth and dimensionality. But when it’s bad, the 3D just makes the bad composites that much worse. Luckily, underneath it all is an outstanding adaptation of the story of The Hobbit for the big screen – a film that overall still looks spectacular – and a fine addition to your Blu-ray collection.